The Telegraph Building was located on Main Street in Houston. Picture from 1856. Image available on the Internet and included in accordance with Title 17 U.S.C. Section 107. Houston Academy building, 1859. Courtesy of the University of Houston. Image available on the Internet and included in accordance with Title 17 U.S.C. Section 107. 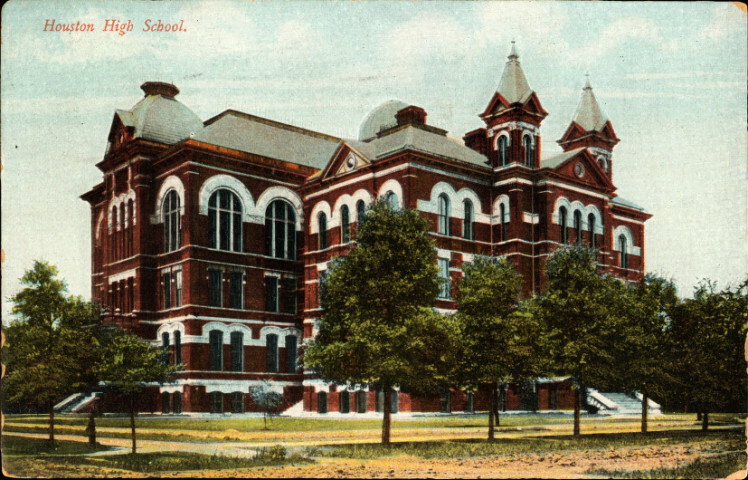 Houston High School, 1895-1926, was previously the Clopper Institute, and before that, the Houston Academy. Image available on the Internet and included in accordance with Title 17 U.S.C. Section 107. HOUSTON ACADEMY. Three schools in Houston were named Houston Academy. The first was a college preparatory coeducational institution opened by Henry F. Gillette in the Telegraph Building in Houston in 1844. It probably closed in 1846, when Gillette moved to Independence. In 1848 a governing body of ten trustees was established for a new coeducational and nondenominational Houston Academy. The school was chartered on August 29, 1856. Its incorporators included William Marsh Rice, Peter W. Gray, Cornelius Ennis, and Thomas W. House. A building plan was developed by 1857, and the school opened in 1858. By 1859, with the help of a bequest of $5,000 from James H. Stevens and $20,000 raised by public subscription, the school occupied a two-story brick building and accommodated 400 students, with separate classrooms for boys and girls. Ashbel Smith served as superintendent. In addition to the usual academic subjects, classes were held in fencing, painting, and gymnastics. Sam Houston gave a speech at the school in December 1860, when it had 150 pupils. The academy was closed during the Civil War, and the building converted into a military hospital. The school's 600-volume library was used by wounded soldiers. In 1866 the academy reopened with W. J. Hammock as principal, 205 students, and a faculty of six. When the public schools opened in 1876, Owen L. Cochran presented the academy library to the Houston Lyceum. The school operated as part of the public school system thereafter and in 1878 was remodeled and renamed Clopper Institute, in honor of Professor E. N. Clopper. Yet another Houston Academy was opened by professor Chris W. Welch in 1896 in a large house at Polk and Jackson. By 1900 its graduates attended Yale, Harvard, the University of Virginia, and other prestigious colleges. In 1906 this school moved to a larger house at Caroline and Hadley, where ninety boys and girls attended. Hans Peter Nielsen Gammel, comp., Laws of Texas, 1822–1897 (10 vols., Austin: Gammel, 1898). Houston Chronicle, April 19, 1936. Marguerite Johnston, Houston, The Unknown City, 1836–1946 (College Station: Texas A&M University Press, 1991). William Franklin Ledlow, History of Protestant Education in Texas (Ph.D. dissertation, University of Texas, 1926). Vertical Files, Dolph Briscoe Center for American History, University of Texas at Austin (Henry F. Gillette, Houston Academy). WPA Writers Program, Houston (Houston: Anson Jones, 1942). Handbook of Texas Online, Diana J. Kleiner, "HOUSTON ACADEMY," accessed April 23, 2019, http://www.tshaonline.org/handbook/online/articles/kch11.